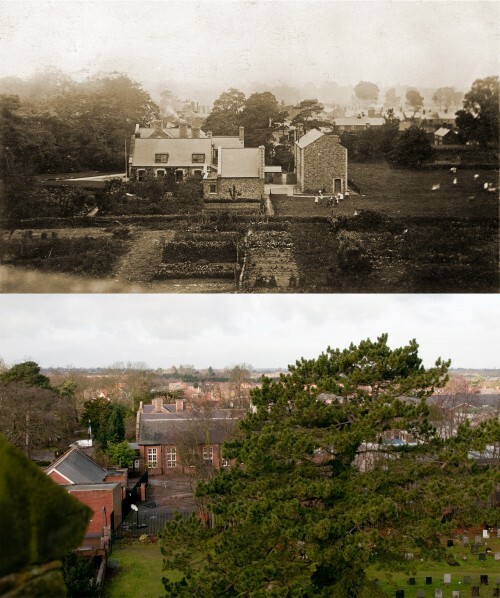 These photographs were taken from the top of the Church tower, looking towards Rawlins School. The older picture (approx 1915), was taken before the Farnham Memorial Hall (the old school gym), was built in 1939 and the Church Rooms in 1929. The buildings in the main part of the picture all still exist, although today they are almost hidden by the Farnham Memorial Hall and large evergreen trees. The newer picture was taken in February 2013. The white 'specks' to the centre and right of the older picture, are children playing. You can also see allotments where the open part of the Church graveyard and the Church Rooms are today.